Tim Woos appeared on Show 213, recorded in February 2010, at age 17. Timothy Woos (composer/bassoon), 17, from New Haven, Vermont began playing the piano at age 8 and wrote his first composition in sixth grade. As a composer, he has received honors from the ASCAP Foundation and had his pieces performed by members of the Vermon Symphony Orchestra and the Vermont Youth Orchestra. 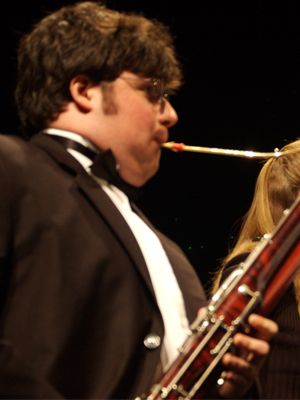 Homeschooled, he performs bassoon with the Vermont Youth Orchestra and has played with the Champlain Philharmonic Orchestra and the Opera Company of Middlebury’s pit band. He also loves boxing, making pancakes and pierogies, and taking German classes at Middlebury College. Tim is a Jack Kent Cooke Young Artist.